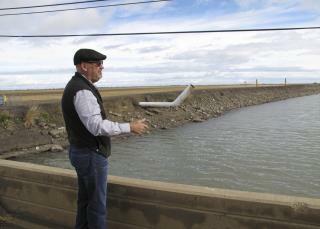 (Newser) – A canal that delivers vital water supplies from Northern California to Southern California is sinking in places. So are stretches of a riverbed undergoing historic restoration. On farms, well casings pop up like mushrooms as the ground around them drops. Four years of drought and heavy reliance on pumping of groundwater have made the land sink faster than ever up and down the Central Valley, requiring repairs to infrastructure that experts say are costing billions of dollars. In wet years, groundwater provides about 40% of the water used in California, but in times of drought, groundwater can amount to 65% of the state's water supply. The slow-motion land subsidence that's occurring—more than 1 foot a year in some places—is not expected to stop anytime soon, experts say, nor will the expensive repairs. Last year near Corcoran, the land sank 13 inches in eight months, researchers at NASA's Jet Propulsion Laboratory found by comparing images collected over time from satellites and airplanes. Parts of the California Aqueduct, a massive canal that delivers water 400 miles to Southern California, also sank by nearly 13 inches. Sinking land has stopped work on part of a historic project to return water flows to an irrigation-depleted section of the San Joaquin River. The moral of the story is that there's no limit to the ignorance and corruption of the political puppets entrusted to manage the resources of the state. In that they'll literally let the taps run dry, and say, "Doh, what happened? Sure didn't see this act of God coming." California is toast. It is impossible to maintain that many people and that much agriculture in a long term desert. The warm period started in 1880 is over and cooler denser air holds a lot less water. Get out while you can, because it is only going to get worse. This is only the beginning of the catastrophic effects of global cooling. California has been tapping the land for many decades to create lovely landscapes but also keep agriculture thriving. For the same number of years they knew the land was sinking. Prior to this drought there were others. A desalination plant was started then but the rains came finally and it was abandoned. It's not just about lack of common sense in California. In fracking areas, there are now 10-20 mini earthquakes weekly where none had never been reported before. In those towns, citizens have filed class suits but they too will discover you do not fight Big Ag, Big Pharma or Big Oil. Each retains high ticket lawyers with direct lines to congressmen.